Kent Dobson, teaching pastor at Mars Hill Bible Church, combines his studies of Jewish and Christian scholars to supplement God's Word in NIV First-Century Study Bible: Explore Scripture in Its Jewish and Early Christian Context. This hefty slip-covered hardback Bible contains a whopping 1850 pages, including the complete text of the Bible, maps, color illustrations and photographs, charts and graphs, study notes, word studies, introductions, outlines, and articles. The pages are designed to look like the parchment of a scroll, and the larger standard font makes the text clear and readable. The NIV First-Century Study Bible is a great tool for older students and for anyone wanting to delve into the context of Bible times, "proving that the Bible is a living book." All the extras in this Bible make it a wonderful resource for homeschool history, language arts, literature, and Bible studies. Weeping (bekheh) This is the only place in the Hebrew Bible where this word occurs as a noun. The word bekheh means more than 'crying.' It has the sense of vocal groaning, wailing or even convulsing. Ezra is deeply moved in spirit as he confesses and prays to the Lord (compare Nu 25:6) (p. 62 Ezra 10). These word studies add a fantastic element to the Bible, providing opportunities to incorporate language arts with Bible study. As a homeschool teacher, I find this Bible to be an excellent textbook in itself. 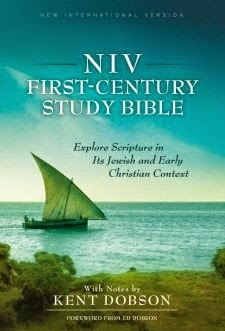 The historical background provided adds even more to the NIV First-Century Study Bible, and the detailed Table of Contents list each article. I can easily make out my lesson plans from there. In addition to the "study Bible" aspect of this edition, you can, of course, simply read it for the joy of absorbing God's Word.